Product Dimensions (D x W x H): 11.5" x 15.5" x 25"
Cut Size: : 3/16" x 1", 3/32" x 5/8"
Shredding is one of the necessary practices we should follow in our offices and homes because of the confidentiality of various documents. This is why MBM has introduced the Destroyit® 2465CC cross-cut shredder that best suits small office requirements for shredding paper, paper clips, credit cards. The solid steel cutting shafts ensure proper wear and tear of paper while the smart shred control avoids paper jamming by keeping the user updated regarding the sheet capacity through a smiley face. For users protection there is an electronically controlled safety flap. The efficiency increases when we see that the Destroyit® 2465CC features the ‘Zero Energy Standby Mode’ which is responsible for automatic disconnection of power exactly after 30 minutes, as a result zero energy is consumed after these 30 minutes. 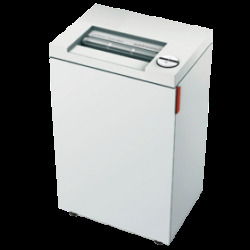 It is due to the double motor inside the 2465CC that the shredder is saved form over-heating, so the user can use it will full efficiency. Additionally, the four casters make movement easy to transfer the shredder from one location to another. This Destroyit® 2465CC cross-cut shredder is not only economically priced but is competent enough to cater your daily shredding needs. Partical Size 3/16" x 1", 3/32" x 5/8"